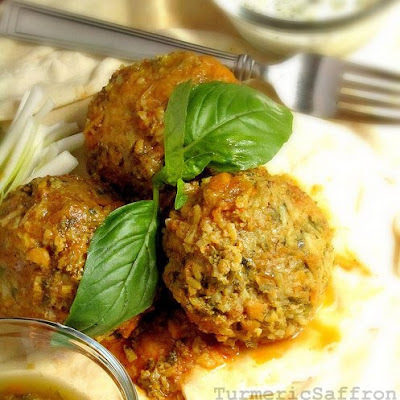 I am very pleased and honored to be sharing one of my favorite recipes with Heidi Noroozy and her co-authors of the wonderful Novel Adventurers blog. 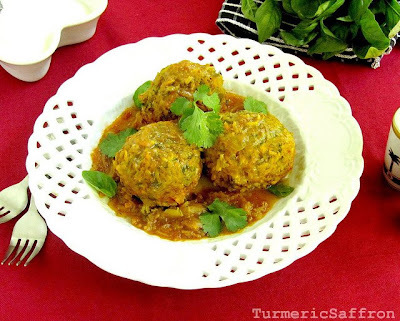 کوفته برنجی Koofteh berenji (rice meatballs) is a one-meal dish made with rice, meat, yellow split peas and finely chopped fresh herbs shaped into balls and simmered in fried onion and tomato sauce. 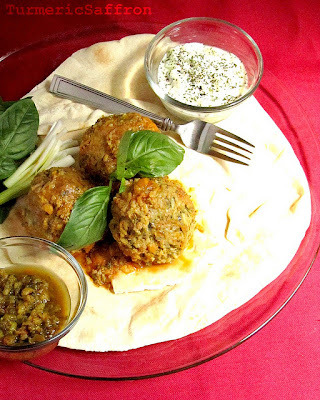 Please head on over for my Koofteh Berenji recipe along with a tribute to my maternal grandmother. In a large pot bring 4 cups of water to a boil on medium heat, add in the rice and 2 tablespoons of salt and boil for about 7 minutes. Drain and set aside. Place yellow split peas and 4 cups of water in a medium-sized pot, bring to a boil, reduce heat, and cook for about 30 minutes on medium heat. If there's any liquid left, drain and set aside to cool. In a large bowl, combine the rice, peas, ground meat, chopped vegetables, chickpea flour, turmeric, saffron, salt and pepper to taste. In a small bowl whisk the eggs and then blend in well together with the rest of the ingredients. Take a handful or 1/4 cup of the mixture and shape into a ball. You make a hole in the middle and stuff some barberries, raisins, walnuts and fried onions inside. In a large pot, saute sliced onions in a 3 tablespoons of vegetable oil over medium. When transparent, add 1/2 teaspoon of turmeric and minced garlic, saute for another 2-3 minutes. Add in the tomato paste and continue cooking for another 5 minutes, stir well. Pour 5 cups of water into the pot, bring to a gentle boil and one by one place each koofteh into the pot, cook for about 50-60 minutes on medium-low heat. Do not cover the pot completely. You may place a colander upside down over the top. Taste and adjust the seasoning and add more water if necessary. Serve in a deep platter with yogurt, pickles, sabzi khordan (fresh herbs) and bread. Summer is almost here, with its typical hot and humid weather and the all too familiar music of the ice cream truck driving through the neighborhood followed by the excited screams of the neighbor's kids. 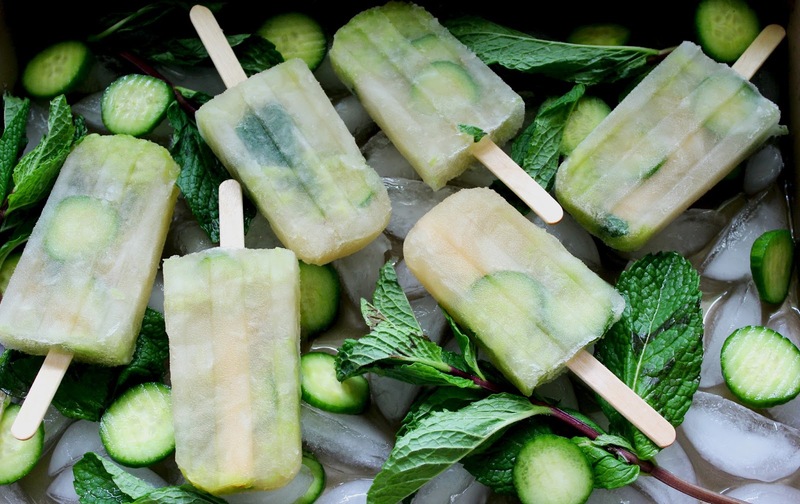 So, I thought what better way to welcome the summer than with a mint and cucumber سکنجبین sekanjabin - but not the usual ancient cool beverage or the syrup dip served with fresh lettuce, but as ice pops! These are not your average frozen pops. They have the sweet and sour combination flavor that is typical of Iranian cuisine with vinegar and honey/sugar. Ice pops are a wonderful treat any time of the year but having a tasty ice pop on a hot summer day is just a delightful experience. I still remember the taste of the orange popsicles that I used to buy from the corner grocery store of my grandmother's house in Tehran. When my children were little they enjoyed their ice pops from the ice cream truck after swimming in the pool in the summer. Now, I usually get a box or two of multi-colored ice pops and that lasts us the entire summer. سکنجبین - Sekanjabin syrup is usually served in a small bowl and eaten with fresh lettuce leaves. Sekanjabin drink is made with 2-3 tablespoons of sekanjabin, ice, water and grated cucumbers. Even though I absolutely love the taste of sekanjabin now, I didn't appreciate its strong flavor and aroma as a kid. Now, by trying to turn this delicious drink into a بستنی یخی bastani yakhi popsicle I'm hoping it will appeal to the younger generation and those of us kids at heart. This is a simple recipe and a fun one to do with the kids over the summer. I have made few changes in my sekanjabin recipe to make these pops more palatable. Long before the discovery of electricity and the invention of the refrigerator, having an ice cold drink in hot summer days required some planning, hard work and patience. Yakhchal (ice pits) were built in hot and dry areas to make ice during the winter and to preserve it for use in the summer. As a child, I visited one of these yakhchals in the south of Tehran with my mother. The image of that man-made ancient refrigerator which was made out of mud and clay is still etched in my mind and makes me appreciate making ice-pops in a much more convenient freezer. In a heavy-bottom pot combine honey, sugar and water, place on medium heat, bring the water to a boil, stir until honey and sugar are dissolved, lower the heat, simmer for about 10-12 minutes or until it thickens a little bit. 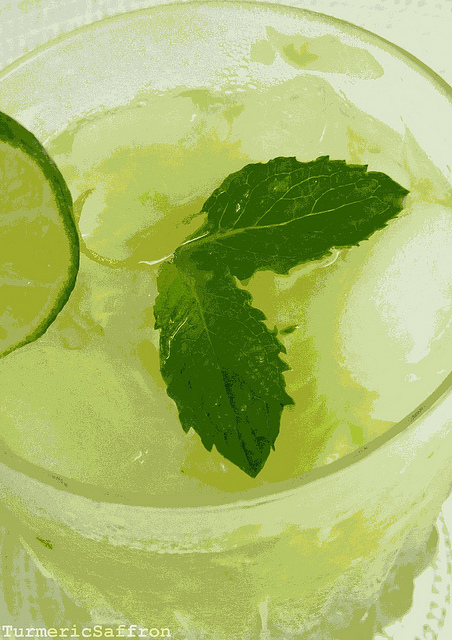 Add vinegar, lemon zest and mint leaves, stir and simmer for another 7-8 minutes. Remove foams with a wooden spoon. Taste and adjust the flavors. Add a teaspoon of rosewater, remove from heat and let cool completely and then strain it through a fine-mesh sieve. 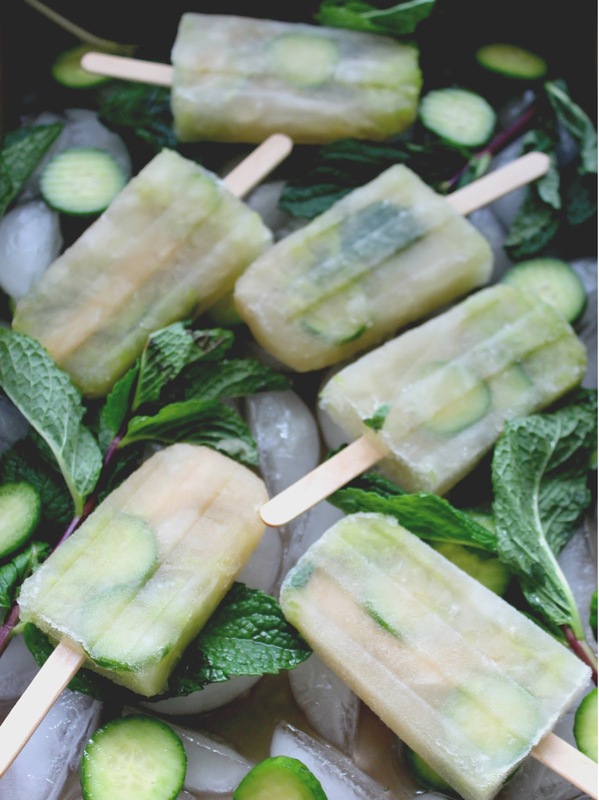 Place a teaspoon of shredded cucumber and a couple of mint leaves in each mold. Pour the mixture into Popsicle molds. I used this ice pop mold. Insert the ice pop sticks and place in the freezer until firm about 3-4 hours.